A while after the iPhone 4S announcement, I posted a piece on the iPhone 4S' cellular architecture and talked about the new inclusion of HSPA+ alongside CDMA2000 1x/EVDO and some specifications. Since then, there's been some ongoing confusion about whether the device supports HSPA+, whether it's "4G," and just what all that really means. It's funny because this issue came up with the HP Veer 4G on AT&T a while back, and with that particular device I did a similar explanatory article in the context of a This Just In post. I wager the somewhat limited cross shopping (and commercial success of the Veer) resulted in many iOS users missing that discussion, and it's cropping up again for the iPhone 4S. The confusion is really twofold. First is a misunderstanding about 3GPP releases and what features are optional or mandatory. Second is a misunderstanding about HSDPA, HSUPA, and modulation coding schemes. Let's break it down. UMTS standards are defined by an organization known as the 3rd Generation Partnership Project (3GPP), which is a body comprised of partners like telecommunications companies, wireless carriers, and cellular hardware manufacturers. Standards are important, and their formation requires collaboration and discussion. Major revisions are finalized, synchronized, and become "releases." For example the first releases define GSM, release 99 defines UMTS, release 5 defines HSDPA, 6 defines HSUPA, 7 - HSPA+, 8 - LTE, and 10 - LTE Advanced. This is a huge oversimplification, but you can see how major milestones are bundled up and become releases, and thus when baseband manufacturers like Infineon, Qualcomm, or ST-E release hardware, they're said to be compliant with a given release, and inherit the big features from releases before it. Where confusion arises is that you don't need to include every feature from some release to say that your hardware is compatible with a given release, and really only features from release 99 are mandatory if you're out to make some UMTS hardware. So when a baseband is "HSPA+" (which really is a colloquial name for the improvements to HSPA made in 3GPP release 7), it doesn't need to include every last feature. Features included in release 7 include things like reduced signaling, faster call setup, continuous packet connectivity, reworked RCC states (idle, DCH, FACH, e.t.c), MIMO, and higher order modulation support. On the downlink, 64QAM or MIMO gets added, and on the uplink, 16QAM gets added. The confusion in the case of many HSDPA 14.4 (Category 10) devices seems to center on whether it is or isn't HSPA+ if it doesn't include 64QAM support on the downlink (which starts in category 13). This is one of those few times that looking at the Wikipedia table for HSDPA UE categories can be misleading. UE categories with 64QAM are introduced in 3GPP release 7, however it's up to manufacturers to include or not include that feature when actually making hardware. It's interesting to me that all of this misinformation comes up over HSDPA UE category, and somehow HSUPA UE category never gets brought up - I haven't seen anyone claiming that some baseband isn't HSPA+ because it excludes 16QAM on the uplink, yet the overwhelming majority of devices are just using QPSK. Apple hasn't stated what baseband is in the iPhone 4S (and I guess we won't know absolutely for certain until it gets opened up), but it is almost without doubt MDM6600 just like the Verizon iPhone 4. The specs all line up, and while that part doesn't include 64QAM on the downlink, it does include a number of the other HSPA+ features I've mentioned, and is thus 3GPP Rel.7 and therefore "HSPA+." Actually using these higher orders of modulation requires favorable radio conditions, of course, and the result is that 64QAM on the downlink or 16QAM on the uplink only gets used in very well tuned systems or cell center. There have been some drive tests done which have shown that 64QAM only really gets used 10% of the time on average. In the iPhone 4S' case here in the USA, it's silly to argue about whether or not the phone can decode 64QAM if AT&T doesn't even use it. A few Samsung devices so far have been based on ST-E's Thor 5730 HSDPA 21.1/Category 14 baseband, and include an engineering menu which shows the percentage of frames encoded using QPSK, 16QAM, or 64QAM. Note that 64Q is 0. I have run many other tests where 16Q is 100. I've shown a few other interested people how to see this menu on the Samsung Infuse 4G on AT&T, and thus far none of them has seen any 64QAM frames show up. I've never seen 64QAM pop up either, even with line of sight to the tower in the middle of the night. Those markets include my own in Tucson, AZ, and New York City, which are both AT&T "4G" markets (connoting HSPA+ with improved backhaul) on the coverage viewer. Two data points isn't enough to say conclusively that AT&T isn't using 64QAM, but I haven't seen it yet. You can also see this on video from an Infuse in NYC. Not all AT&T WCDMA "3G" markets are HSPA+, but if you're in a market that AT&T has marked with dark blue (and calls "4G") you can be pretty much assured it's HSPA+. 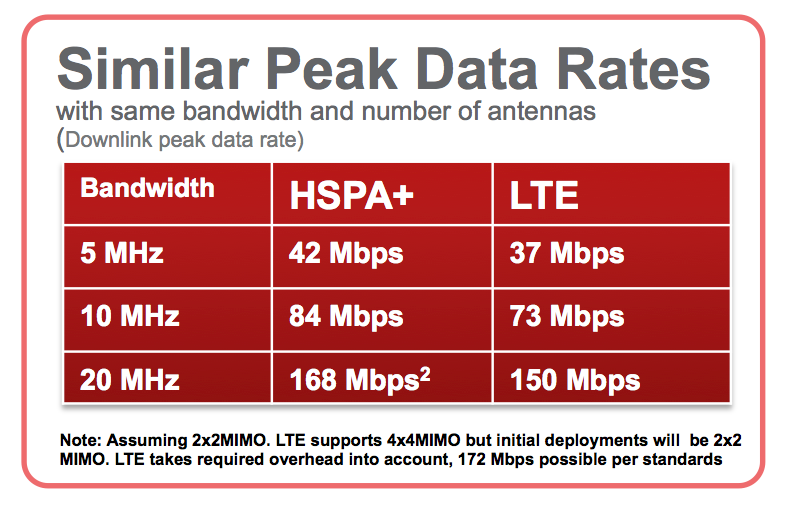 That's saying nothing about network latency, however, where LTE will continue to outshine HSPA+. In that case, it does arguably make sense to associate DC-HSPA+ with real LTE and call it real 4G, but until DC-HSPA+ or at least HSPA+ with MIMO it is almost without doubt still 3G. Obviously USA carriers' attempts to pass off HSPA+ 14.4 or even 21.1 as "4G" is immediately laughable marketing, but DC-HSPA+ is arguably real 4G. Lastly, rumor has it that AT&T and Apple are "working together" to change the 3G status indicator to "4G" for AT&T in the US, a move that would mark the first carrier intrusion into the otherwise completely carrier-untouched iOS. I don't have issue with the status indicators showing H or H+ (for HSPA and HSPA+ when appropriate), but misleading indicators do nobody justice and just serve to reinforce these kinds of misconceptions. Apple at it's same tricks really.. Since they couldn't deliver on 4G, they think.. oh well let's just put the 4G icon on there even thought it's not.. Users will eat it up and it's all good. This is what's disgusting about that company. Not to mention the idiot users using their phones now yapping and yapping how iPhone 4S actually has 4G.. I can already hear it : "Yeah, iPhone 4S owns because WE DO HAVE 4G.. you see.. there it says 4G in the corner"
Don't be naive. All carriers, and all companies hype up their crap. iphone 4's have no trouble using dictation, google voice, or voice controls, yet i can see a future where the iphone is left out of the siri updates. OMG, you don't even know what you're talking about. There's a difference between voice control and siri. Dude, Siri is a collection of web-based services that the device interacts with. The device uses voice recognition to work out what information to send to the web service(s), and that's it. Thus, any device that supports voice recognition and network access (i.e. virtually all of them) can work with Siri just fine. Um, Siri (the app) is not the same as the current iteration of Siri (integrated). As a user of both, it is laughable to compare the two. Siri (the app) was woefully inaccurate, as well as slow, and the creator even said it took a lot of work (and reducing some features) to get it to work on a mobile device such as the 4 or 3GS. The app also couldn't access anything on the phone, didn't speak to you, and wouldn't really converse for you. Siri (integrated) on the other hand is very accurate, even in areas with high ambient noise, and is likely due to the better speaker and microphone on the 4S. It also runs considerably faster (due to the A5 chip), and speaks and converses with you. You can also access things on the phone, like to-dos, SMS, etc. 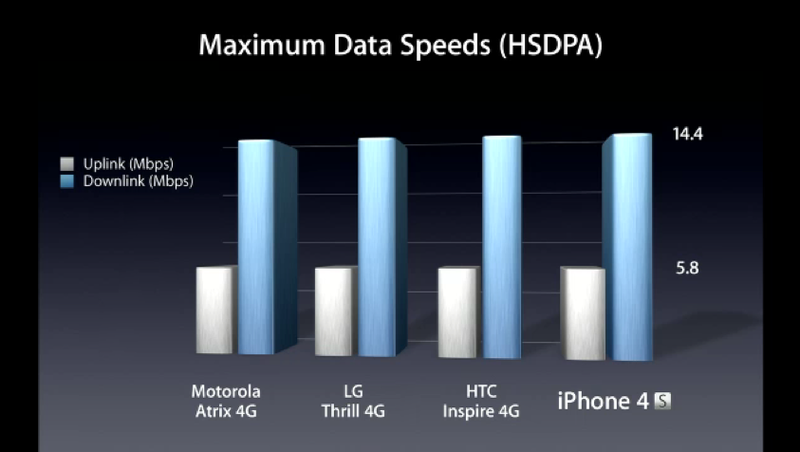 So Apple are the bad guys because of a completely unconfirmed rumor that they'll brand a non-4G technology as 4G? does anyone else find this comment hilarious? i've learned that the one's that call out "fanboys" are "fanboys" of another.